On July 14th of this year, I was scrolling through twitter and saw a graphic of graphic of a bunny holding a sign, and thought, “cute, Imma try that. cut/paste/fill in sign text/ what could it say... umm... "Vaccines Cause Autism.” Tossed up the little throw away tweet and didn't think of it again. I have been investigating and writing about the relationship between vaccines and autism since 2004, and put out a few thousand tweets on the subject, that get a bit of discussion, but none prepared me for The Great Vaccine Autism Bunny Ratio of 2018. A few days ago someone RT'd it somewhere, and twitter noticed and it made many of them very unhappy. Hundreds of comments flowed in. I was all, “Wait... THIS is what gets people to pay attention to this subject and engage with us on vaccine risk? !” A decade of documenting fraud, discussing research, sharing government vaccine safety guidelines, sharing videos of official government meetings on vaccine safety, and apparently I should have just tweeted three word bunny memes. Despite decades of parental requests to have these and other lines of inquiry followed up, CDC and NIH have refused to conduct any large scale follow up research on these findings. There are no studies proving that vaccines don't cause autism. The American Academy of Pediatrics offers 48 papers that fail to find an association between vaccines and autism. Note that unlike my list which makes clears that it is ONLY offering the evidence that supports the vaccine/autism link, AAP's article title suggests that you are getting ALL the evidence. It then proceeds to give you ONLY the research that fails to find an association between vaccines and autism, while presenting not one of the papers I have offered. My initial response is, “What? How did you get from “Vaccines cause autism” to there? I haven't made ANY vaccine recommendations here! Then I remembered that there is a 30 billion dollar per year vaccine industry committed to you making these kinds of leaps. You seem to have assumed that I am advocating for an end to vaccination. I am not anti-vaccine, and my children are vaccinated. I have written a lengthy discussion of my vaccine position and experience for the Johns Hopkins Journal, Narrative Inquiry in Bioethics. This is not an either/or proposition. There is risk from both complications from any vaccine, and the diseases that the vaccine is targeting. We must have an honest evaluation of both, and use that information to prevent harm in either case to individual children with DIFFERENT biological risk factors for each. I do not give advice to others on whether or not to vaccinate, or how to vaccinate, I merely offer resources to families so that they can make their own decisions. But did you know that the vaccine schedule when I was growing up was 24 doses, birth to 18, and the current schedule is 70 doses? And that the tripling of the vaccine schedule began in 1988, two years after Congress gave the vaccine industry complete immunity from lawsuits against vaccine injury or death? 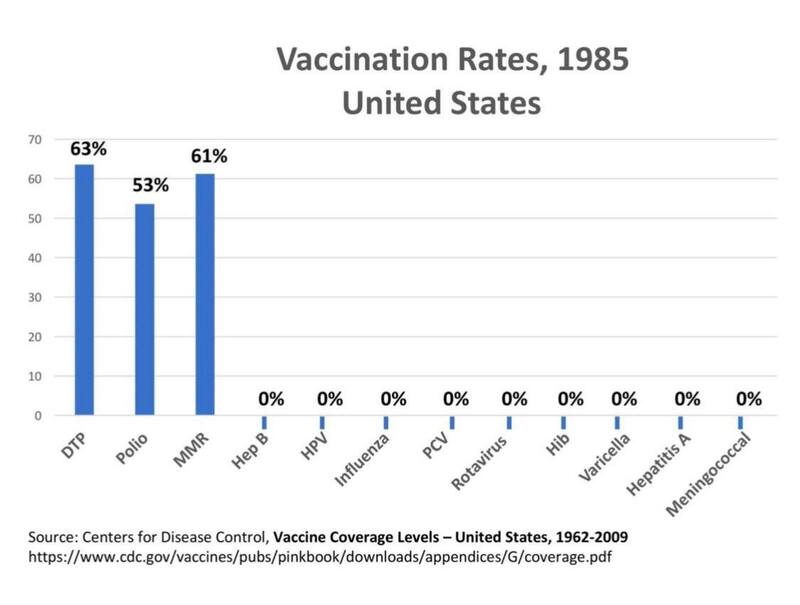 You know that there was no autism epidemic in the 70s and 80s OR epidemics of vaccine targeted diseases, right? Even for the diseases that we now vaccinate for, but didn't then. So how is this a choice between fully vaccinating now, or death? If I survived with a third of the vaccines kids get now, then why must I have to vaccinate my children the way I was vaccinated or watch them die? And why arn't children dying left and right in Denmark? Could it be that you have been lied to by the vaccine industry about exactly how badly their products are needed? 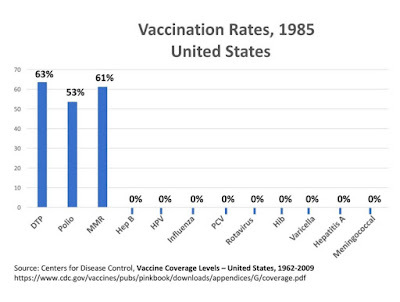 Here are the vaccine coverage rates in the US when I was in high school. Where were all the epidemics? 2. Scientific research should only be carried out with the prior, free, express and informed consent of the person concerned. The information should be adequate, provided in a comprehensible form and should include modalities for withdrawal of consent. Consent may be withdrawn by the person concerned at any time and for any reason without any disadvantage or prejudice. Exceptions to this principle should be made only in accordance with ethical and legal standards adopted by States, consistent with the principles and provisions set out in this Declaration, in particular in Article 27, and international human rights law. I work toward vaccine safety reform and informed consent. We need a dramatic overhaul of the National Vaccine Plan, including prescreening for genetic and autoimmune risk factors before vaccines are administered, immediate treatment of symptoms arising post vaccination, mandatory education for doctors and health care providers on government and manufacturer vaccine safety guidelines, alternate schedules for high risk cases for reactions, low cost readily available titers testing, and most importantly, the repeal of the 1986 National Childhood Vaccine Injury Act. There is a rapidly growing research base on autism causation and treatment that health officials are ignoring, that can make vaccination safer, and improve the quality of life for those with autism. Health officials must implement this established science and end the false dichotomy of “fully vaccinate or die” arguments. 5. “...better education for doctors” lmao how about better education for ginger taylor instead?" We introduce a bill in Maine to mandate training for doctors on manufacturer and federal vaccine injury guidelines. In their testimony, the doctors showed that they didn't even know there were federal guidelines. 6. Yes you ARE anti-vaccine! No. Talking about vaccine risk and vaccine injury does not make one anti-vaccine, and more than talking about the serious side effects that some people have from antibiotics makes one anti-antibiotic. Here the Department of Heath and Human Services discusses many of the serious adverse reactions some have to vaccines, including death. This does not make HHS anti-vaccine. No, The Theory of Vaccine Induced Autism Did Not Begin With Andrew Wakefield. The first paper to link the two was the first paper on autism, by Leo Kanner in 1943. The idea was discussed for decades, to the point that in 1991 the Institute of Medicine was including it in their reports on vaccine safety funded by the National Institutes of Health, published by the National Academy of Sciences and edited by none other than Harvard's Harvey Fineberg... seven years before the Wakefield paper. 8. "But I know someone who has autism and was never vaccinated, so you fail!" There are several genetic and environmental causes of autism. Vaccination is merely ONE of the environmental causes. They also include medications taken during pregnancy, medications administered in childhood, and contaminants in the food, air and water. There are unvaccinated children with autism. 9. "But I got all the vaccines and am not autistic." Not everyone who eats a peanut goes into anaphylaxis. Nor does everyone who gets a bee sting or takes penicillin. But some do. It is the same with vaccines. Not everyone will have a vaccine adverse reaction, but some do. Spend some time reading the adverse reactions of each vaccine, and what contraindications each shot has, that can help predict who will have a bad reaction ahead of time. Package Inserts and Manufacturers for some US Licensed Vaccines and Immunoglobulins. 10. "Well then why don't you just shut up and sue them?" This is a very, very good question. Kudos. I wish I had asked it before my kids were vaccinated. In 1986, Congress passed the National Childhood Vaccine Injury Act that was eventually interpreted by the Supreme Court, which barred those injured by vaccines, or families of loved ones killed by vaccines, to file lawsuits against pharmaceutical companies that made the dangerous vaccines. 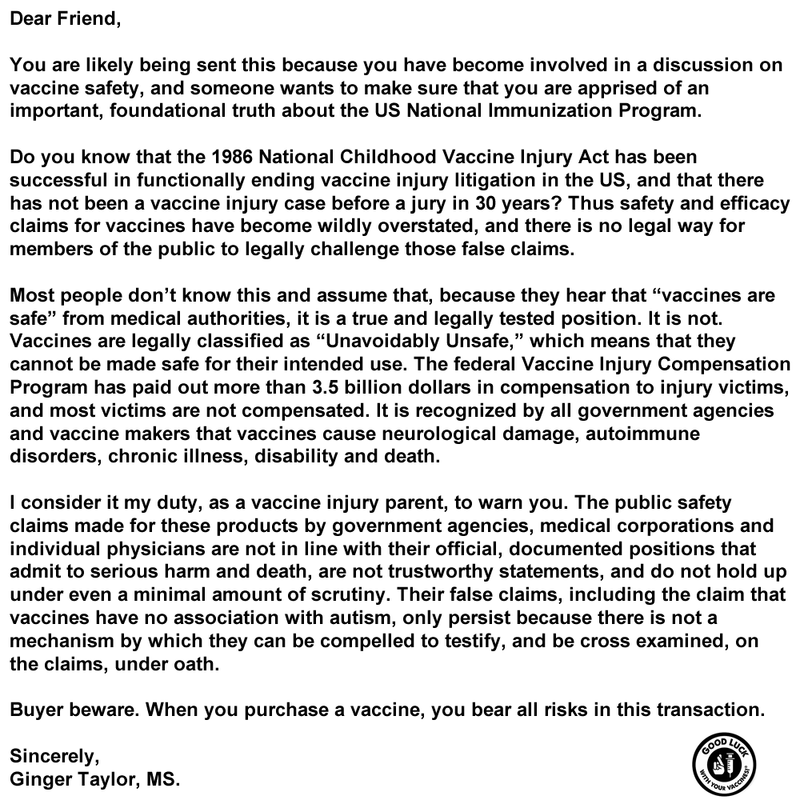 At the same time, Congress declared all FDA approved vaccines, "Unavoidably Unsafe" which means it cannot be made safe for it's intended use. Then Pharma started a campaign to declare that "Vaccines Are Safe," and to mandate them for first school children, then medical professionals, then those dependant on social services, and soon for everyone. Based on the claim that "vaccines are safe" even though they are "unavoidably unsafe." You think that this would be an easy law suit to win, but again, no family has be able to get into a civil court and have a jury hear any vaccine injury case in more than 30 years. It is a mess. So to those who are vaccinating. Buyer Beware. Do your homework first. Thousands of families like ours have learned the hard way. Once you have a vaccine injury, you are on your own. 11. "Why does that number keep changing? It was 130-something. Then 149, 150, 151...Every time you posted this the number has been different. You having a go? 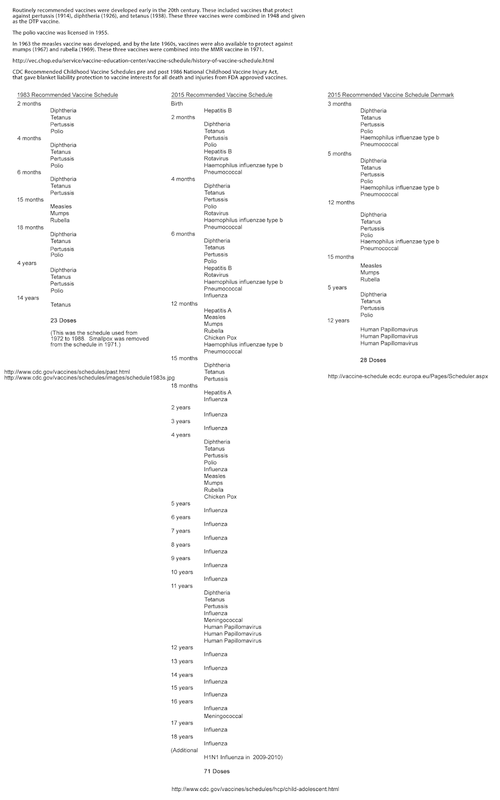 I have been compiling this list for 11 years, it started with 18 papers. Every time I add a new paper ScribD changes the link. You are just seeing copies of the old link. The current list in 151. I already have more to add, but have not done so yet, so you will likely come across higher numbers, and the science behind vaccine autism causation is growing rapidly. By contrast, there has not been a paper that failed to find an association between vaccines and autism since 2015 according to the American Academy of Pediatrics. 12. "You are not a good person." As a Calvinist, I have no rebuttal to offer you. Your contempt has been noted. Thank you for your input. 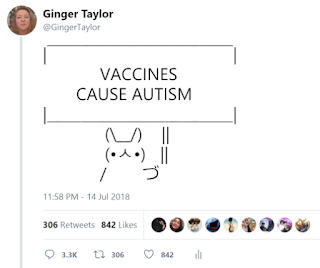 I am still grateful that the Vaccine Autism Bunny and his ratio has brought us together. I know that this hit you the hard way, but I still hope you are able to glean a little something from this discussion, even if it is only that it is not as straight forward a matter as you initially thought it was. I can't. I have a duty to warn. I am pro vaccines but this offers insight. Good read. I like your point about “not everyone who eats a peanut goes into Anaphylaxis” and your very right. Yes vaccines may not give every child autism but like you stated with certain environmental factors with the vaccines it could be the culprit for causing autism in certain cases. Drugs can be found here. forms of toxicity induced by nano particles. I had my first attack of (AUTISM) when I was a kid, I wasn't diagnosed until seven years later when I was totally experiencing speech delay. It was so terrifying that I began dropping things and losing sensitivity to sounds, having severe fatigue and muscle weakness. A horrible poor eyes contact began. I sometimes can't walk straight and fall onto walls and I get leaning disability, the English medications i used proved abortive. i was so frustrated that i had to contact My neurologist,he told me about a new RRMS (relapsing-remitting MS) drug which was only in its trial stage, CAMPATH. I started the chemo-type treatment and some prescribed drugs like: RISPERDAL, EFFEXOR XR, GEODON and MEMANTINE. which resulted in 1st seizure of my life, thereby adding more salt to my injury. As a result to proffer solution to my problems, i started going online in search for a cure, i came across a testimony of a woman who got her son cure through HERBAL MEDICATION, at first, i doubted because of the misconception that autism can not be cured. But i later contacted the Doctor through the email provided, and I used his Herbal product, after 1 month of use, I noticed tremendous improvement in my health, 5 months after, I can proudly say, I've been totally cured by Dr.williams Herbal Medication from AUTISM..., If you have the same health issue, you may contact him for a total change of story, Via: drwilliams098675@gmail.com . I believe your predicament will be a thing of the past just like mine. You make good points and I agree that it is important for people to learn the risks of all medical procedures along with complications that can arise from them. While scrolling through your list of references it looked to me as if most of them studied people from before 2000. According to the CDC (https://www.cdc.gov/vaccines/hcp/patient-ed/conversations/downloads/vacsafe-thimerosal-color-office.pdf) the FDA removed much of the thimerosal from many vaccines. I wonder if any research has been done on populations receiving the vaccines post 2000. My final concern is the way that you presented your information on Twitter. A single tweet saying only “vaccines cause autism” seems to me that it can fuel people’s ideas that vaccines are nothing but bad, which could further the already growing problem of some preventable disease. Do you think that your tweet does not incite panic into people who get vaccines, if so why not?